Sign Up for a Free 1-Room Safety Audit! 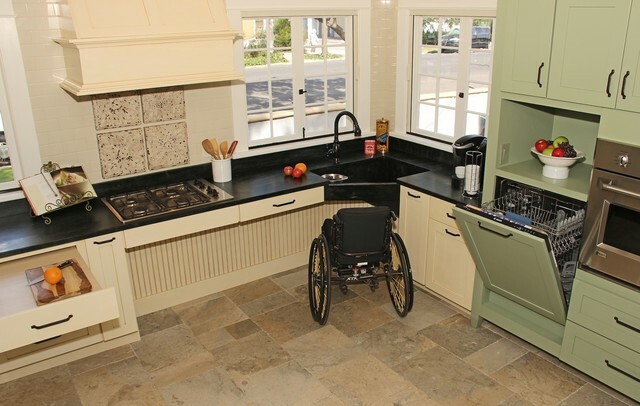 Disabled kitchens must be specially designed to accommodate the specific requirements of those using the space, including disabled, elderly, and non-disabled alike. Our team of Accessibility Experts and Occupational Therapists work to design and customise your kitchen based upon your exact needs and employing Universal Design practices. See what your new fully accessible Disabled Kitchen area will look like with our Free 3D Design*! To help ensure your disabled kitchen is fully accessible and customised to suit your exact needs, while also keeping it affordable, all projects at AccessAble Home Modifications begin with a Free Safety Audit. After asking a few questions about your exact needs, budget, and taking a few measurements as we audit your space, we’ll leave to develop your custom Free 3D Plan*. All designs are reviewed by an Occupational Therapist to ensure full accessibility for all our projects. We fully customise to suit your exact needs, budget and floor plan. So if you don’t see a service you need listed, just Contact Us and ask! AccessAble Home Modifications incorporates Universal Design (also known as “Inclusive Design”) principles and products on all projects to ensure your space is safe and accessible for disabled, elderly and non-disabled usage. All of our designs to improve accessibility are fully reviewed and approved by a Registered Occupational Therapist to ensure the completed space is fully accessible and functional based upon you or your loved ones exact needs. When modifying your home for accessibility using NDIS funding, you do NOT have to choose the government option. AccessAble Home Modifications is qualified to complete NDIS-funded accessibility modifications and we’re happy to help with all your questions. Making Your Home Safe and Fully Accessible is As Easy As 1-2-3! AccessAble Home Modifications provides a comprehensive and Free 1-Room Safety Audit with zero obligation to use our services. We will examine your space, ask a few questions about your specific needs and budget to then create a Free 3D Design* of your completed and affordable room with all Accessibility Features included. After signing up for your Free Safety Audit, we will contact you via email to schedule your appointment. We always arrive within 30 minutes of the scheduled time and the entire process takes less than an hour to complete. During your Free Safety Audit, our Accessibility Expert will ask you a few quick questions to determine your exact needs. Then, we’ll review the space, talk with you about your plans and budget so we can quote appropriately, and then be out of your way in just a few minutes. Within 3 business days, you’ll receive your Free 3D Design* to see exactly how your new fully accessible room will look when complete. *Please Note: On smaller projects, a full 3D Design may not be possible but we will provide visual representations of completed space. Copyright 2017 AccessAble Home Modifications. All rights reserved.